After hearing about the variety of “gaming” tablets on hand at CES this year, like the Razor Edge and Vizio’s Z-60 based tablet, we decided to dust off the Clovertrail based Iconia W510 that we looked at back in December. The object of our intrigue was the potential gaming performance of the Atom Z2670 chip at this tablet’s core. We’d be lying if we told you that we expected the PowerVR based graphics on this SoC to burn through our benchmark suite. But what we weren’t prepared for was how modest the graphics performance of this little chip turned out to be. The first question that every real PC gamer asks when a new graphics card hits the streets is, “But can it play Crysis!?!”. *cough* You’ll have to excuse me, I have a little bit of nostalgia for 2008 caught in my lungs. Never the less, the first game that we loaded onto our tablet was Crytek’s Crysis. Normally this where I’d tell you that, this is a modern piece of hardware, so of course it can play Crysis. Alas, there seems to be an incompatibility between the Steam version of Crysis, Windows 8, and Intel’s Clovertrail drivers. The game simply launched to a black screen and then closed, no matter what compatibility settings we chose. For now I have the duty of reporting that no, the Atom Z2670 can’t render Crysis, let alone play it. With the knowledge that Crysis was out of the question, I decided that I needed to lower the standards of the games I was testing, while trying to pick more modern titles. Deus Ex was the first game that came to mind under these new criteria. We took this screen shot just after our 60 second benchmark wrapped up. I probably don’t have to tell you, but just in case you were wondering we had all of Deus Ex’s advanced graphical features disabled, and all of quality options set to low, and the game was running at the Iconia W510’s native resolution of 1366 by 768. 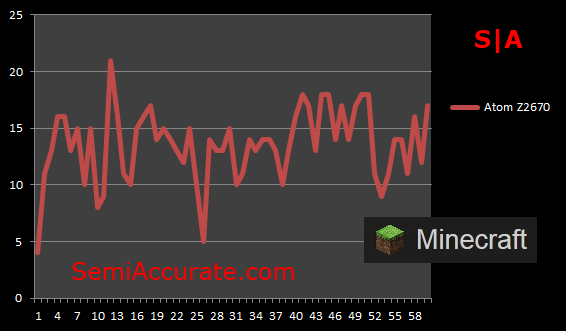 Looking at the frame rate graph above it’s worth noting that time seemed to slow palpably as my brain tried to sync up with the three or so frames per second that were showing up on the screen. 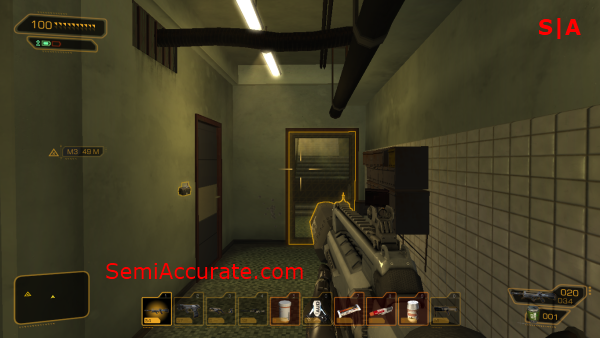 Deus Ex was so unplayable that it was outright comical as I moved around and fired my weapon only to see my actions rendered a few seconds later. 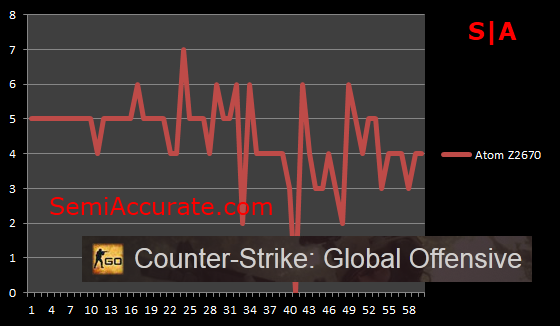 This game was utterly unplayable, but I’m sure the graph above makes that clear. 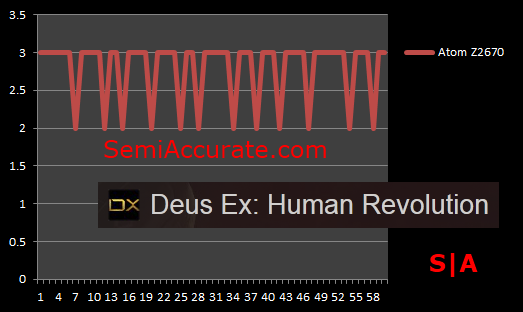 What’s a less taxing and newer game than Deus Ex? 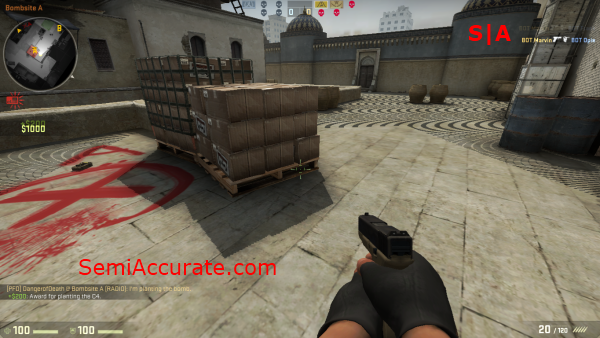 Why Counter-Strike: Global Offensive of course. So that’s what we tried next, and in the process we noticed that Intel’s graphics drivers don’t play all that nicely with this game. Visible corruption can be seen in the screen shot above on the textures in the background. Yep, those wavy-gravy patterns aren’t normal. To the Z2670’s credit though, it did manage to produce a few more frames per second in CS:GO than it did in Deus Ex. Additionally, the game, while still unplayable and suffering from heavy input lag, was smooth enough for me to plant the bomb and win a round. Okay, the new criteria I’m using for picking games that will run well on this tablet aren’t really working out. I’m already using newer mass-market games on their lowest quality settings, how can I find something that’s actually playable? It needs to have simple graphics and a large enough user based to guarantee that Intel has optimized its drivers specifically for it. 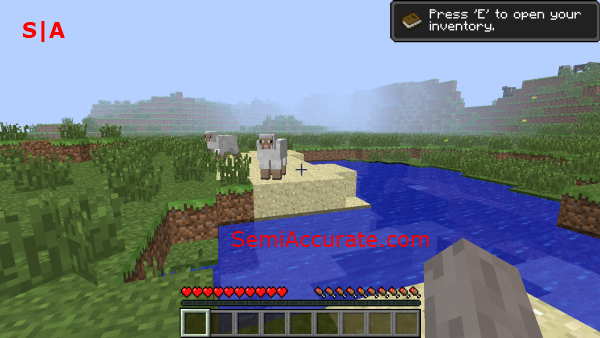 Ah-ha, Meinkraft, *ahem* I mean Minecraft, that’s gotta be the ticket. And it if the Z2670 could have eked out another five frames a second, it would have been the one game that was actually playable on this SoC. Alas, it couldn’t, and 15 frames per second just isn’t playable. It looks like I’ll be going home without finding a single game that was playable on the Iconia W510. I just really wouldn’t want to be the poor guy that buys this $600 tablet thinking that his kid can play Minecraft on it. In retrospect, I suppose that expecting a tablet SoC to run any game at playable frame-rate is a lot to ask. But with a full copy on Windows 8, one of the big advantages of x86 tablets over ARM options is access to the full library of Windows games. It’s just a bit of a tragedy that this little Atom SoC doesn’t have the graphical prowess required to realize that potential. There’s been a lot of talk going around lately about new graphics card testing methodologies. Scott Wasson over at The TechReport, has been pretty open about how his team is working to create new metrics that avoid the pitfalls of the traditional frame per second metric. 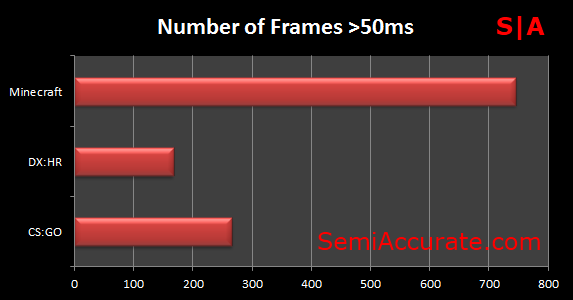 As a show of support for these new ideas we’ve decide to include a chart showing the total number of frames that took over 50 milliseconds to render during our 60 second benchmarking runs. If you were to render a frame every 50 milliseconds you would produce 20 frames per second, which also happens to be my bar for playability. Thus frames that take longer than 50 milliseconds to render are frames that are being rendered at a rate which is less than 20 frames per second, and so these frames are both annoying, and effectively unplayable.